ALL THE TIME GOD IS GOOD! : What Gospel Are You Hearing? Is the Gospel a Political/Social/Activist Gospel? What Gospel Are You Hearing? Is the Gospel a Political/Social/Activist Gospel? We've begun a brief study I've entitled what Gospel are you hearing? Many are proclaiming a message that is an either a Gospel mixture of Law and Grace or of truth and error. There is only one Gospel. The Gospel of our Lord and Savior Jesus Christ. Let's revisit the true definition of the Gospel. The Gospel defined by Thayer's Greek Lexicon is the glad tidings of salvation through Christ. The proclamation of the Grace of God manifest and pledged in Christ. It is that simple. This is the simplicity of Christ. Whenever we proclaim the true Gospel of Christ this is what we are supposed to be preaching. We aren't bringing sad tidings or bad tidings if you will. We are proclaiming good Gospel news. When you hear someone proclaiming a message that is contrary to this, know you're not hearing the Gospel. You're just hearing a message. The pulpit is a place to proclaim the Grace of God. It is a sacred place to lift up and exalt Jesus and His Finished Work. It is not the place to promote a political message. Am I teaching that Christians should not participate in politics? Absolutely not. Each of us abides in some nation of this Earth. As responsible citizens, we can let our personal voice be heard during elections, (unless one's resident is in a place where there is no free election and Government control makes all the decisions the best recourse is prayer and if it all possible perhaps relocation). Though we can personally allow our voice to be heard with a vote, this is not the Gospel message. There are some 200 nations on this planet. Which political message then is the one size fits all message that is part of the Gospel? This mentality is an unfortunate philosophy some cling to. Because Jesus taught giving to the poor and unfortunate some have interpreted this to mean Jesus' message was an ancient form of Marxism. Jesus was not a socialist. He didn't conquer Rome and then "equally" redistribute the goods and property of the Roman empire throughout the globe. Jesus taught freewill giving. He didn't proclaim a message that Government was to impose its will on the people and force them to redistribute their material possessions. The good news Gospel of Grace is a message that doesn't need men to muddle it up with human philosophies and ideologies. Under Grace, we have received the everlasting love of Almighty God within. God's Spirit personally directs our love and giving to be a blessing to those around us. Let's let God be God in people's lives and He will direct their steps. Is the Gospel of Jesus Christ a social or activist message? If it is which cause are we to take to the streets to march and demonstrate for? Which is the one cause all believers in Christ have been instructed to contend with? I have viewed the news media outlets over that past few years, so which cause is the Christian cause? Are believers compelled by Christ to march to ensure Europeans have a 30 hour work week? That American youth shouldn't have to pay for their college education? Is the cause that should unite all believers in Christ, that America has immigration laws that some don't want to be enforced or want to repeal? There is a strong and passionate debate on this issue. If immigration is the issue, then are we called to protest only the United States immigration laws? Why not Canada? Why not Ireland? Why not Israel? Why not Austraila or Japan? I can only trust that you see the futility in labeling this a Gospel issue. We are to proclaim the Gospel of Grace to all nations and tribes and tongues. We are not to add to the Gospel. The Gospel is not the message of liberalism or conservatism. It is not a social movement. I want you to pause your passionate cause for a moment. The Gospel is Jesus plus nothing or is it? Is the gospel Jesus plus a cause or activity? So is the Gospel message Jesus plus "income equality"? 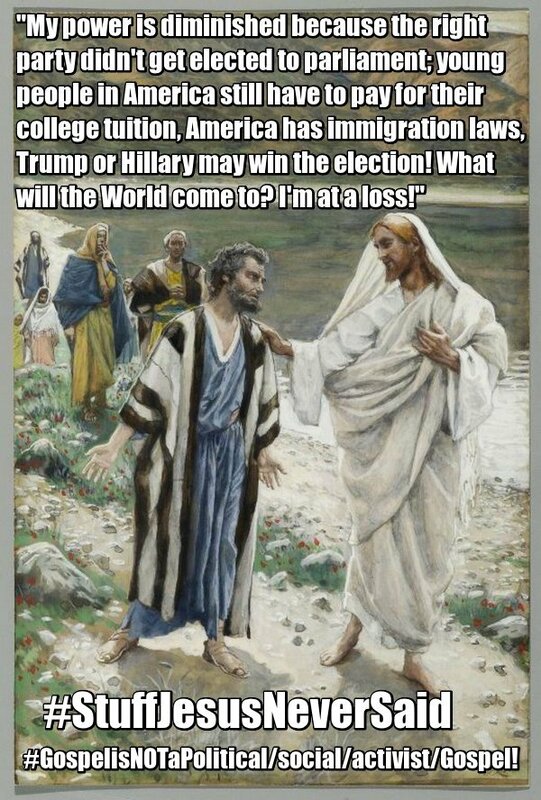 Jesus plus who you vote for? Jesus plus open borders in America? Jesus plus the 2nd Amendment? I wish God would clarify this for us. Allow me to address another aspect of this. The social aspect some cling to also includes good works not just protesting or activism. Feeding the hungry, taking care of the homeless and other good deeds are these the Gospel? If you say, of course, let me frame it another way. What washed us from our sins, cleansing us and what forgave us once for all time? Is it the Blood of Jesus plus taking care of the poor and destitute? Is it Jesus once for all sacrifice plus our giving shelter to the homeless? Is it the Finished Work plus building orphanages? I hope you already know the answer. It is only the shed blood of Jesus that forgives and cleanses us. It is His final sacrifice that washed us, made us clean and exchanged our old life with His new eternal life. It was His Finished Work that made us the righteousness of God in Him, perfect and acceptable in the eyes of our good Father in Heaven. "Oh I know I'm saved, a Christian gave me a hug on the street." "I know I'm right with God because a ministry fed me a chicken dinner." That sounds silly but the way some speak about the Gospel this is the impression they leave and what they declare the Gospel is. Is this accurate? The Gospel is the Gospel of the Grace of our Lord Jesus Christ. It is not a politically affiliated message. It is not an activist cause. It is not a social movement. It is not about doing good deeds. If it is then we've traded the Gospel of Grace for a gospel of works and performance. I sure hope you marched at the right rally, took up the right cause, fed enough hungry, visited enough prisoners, clothed enough naked, and met enough needs to become righteous. Now when we received the Gospel of Grace and have been transformed by His love and goodness, we will begin to bear fruit. Give someone a hug alright, but do it in Jesus name. Hug a fellow tight, but afterwards, share that Gospel with them. Feed the hungry, help the homeless, but make sure they know this is God's love in action. After they're warm and fed, give them the good news of Grace. The Gospel needs to be conveyed for it to be received. The Gospel of Grace is the only thing that brings change to people. Simply feeding them or providing a need is good but not enough to bring about new life. If so the many, many secular thrift and consignment stores in the World should have many lives changed but there is no testimony of salvation because of them. As believers, we have the message that brings hope, love and new life. As we go about doing good and meeting needs let's not omit giving people the good news Gospel of Christ. What Gospel Are You Hearing? Eternal Security: What if we forsake Him?